Last week I announced the release of the third edition of National Fatherhood Initiative’s InsideOut Dad® program, the first new edition of the program since 2012. That post focused on the process we used to create the third edition and the reasons behind issuing it. It also provided a broad overview of the improvements to the program. Click here to read that post. Research and evidence on motivation that will increase dads’ motivation to get the most out of the program and to be involved in their children’s lives. An optional commitment device called the InsideOut Dad® Pledge. Developed with the input of facilitators across the country, dads can recite the pledge as a public commitment to themselves, their children, and the mothers/main caregivers of their children that they will be the best dads. Research shows that such devices increase motivation to initiate and maintain behavior change. We moved the Fathering from the Inside session—during which dads develop their My Fathering Plan—to much earlier in the program. Instead of being Session 11, it’s now Session 6. We added activities to the following sessions that help them test, refine, and get feedback on their plan. Related changes to the following sessions increase retention and application of knowledge and skills. Skills to create good communication patterns with the mothers/main caregivers of their children. How to create the safe environment required for effective communication. InsideOut Dad® now has three sessions on co-parenting to boost dads’ learning in this critical area! This new optional session helps dads learn basic money-management skills, such as how to create and stick to a budget and how to access financial support programs that can help them, the mothers/main caregivers of their children, and their children. This optional session eases dads into the program. It also helps facilitators learn more about the dads that comprise each unique group, including what motivated them to enroll that facilitators can tap into for maximum impact. Added more guidance on where to refer dads in their Fathering Handbook, and that get dads more engaged in using the handbook. Added or removed activities and procedures to improve sessions and the flow and ease of facilitating activities during sessions. Help facilitators better prepare for what might happen during sessions. Guide facilitators in effectively facilitating the program with specific kinds of dads. Clarify concepts and define words and phrases that facilitators can struggle to get across and that dads can have difficulty understanding. Provide additional activities to conduct or information to provide dads when certain situations arise. We also improved and renamed the final session to help dads more effectively process the changes they experience and the impact of those changes on themselves and their relationships with the mother/main caregiver and their children. Altering a design element to make it easier for facilitators to refer dads to exact locations in the handbook. Adding content that facilitators deliver that was not in the handbook but that facilitators said is important to include. We also added content that helps dads refine their My Fathering Plan and work with the mothers/main caregivers to carry out their plan, and that helps dads to more effectively process the changes they experience and the impact of those changes on themselves and others. Moved all of the complementary tools and content—marketing/promotional flyers, handouts, evaluation tool/survey, certificate of completion, videos, etc.—to a USB flash drive. You no longer need a CD-ROM or DVD drive to access and use these vital tools and content. Separated the core sessions and optional reentry sessions into different facilitator’s manuals. Now when facilitating the core or reentry sessions, facilitators will use a smaller manual. Are you ready to order the third edition? Click here to get started! 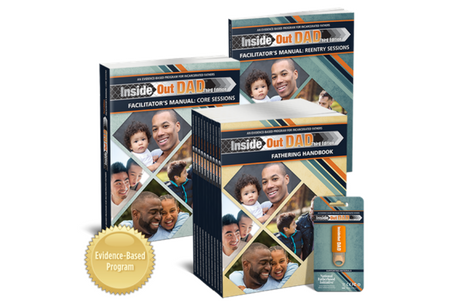 Are you ready to implement a new, improved edition of InsideOut Dad®? There’s no better, more affordable time to upgrade. Have you thought about acquiring InsideOut Dad®? There’s no better, more affordable time to start it.